Cowboys for Trump is a grassroots movement that started only by a gut feeling and a facebook page to express that feeling. Founded by Couy Griffin of Tularosa New Mexico Cowboys for Trump has grown into an organization that has influence and impact regarding today’s shameful division in America that pits partisan politics against one another. 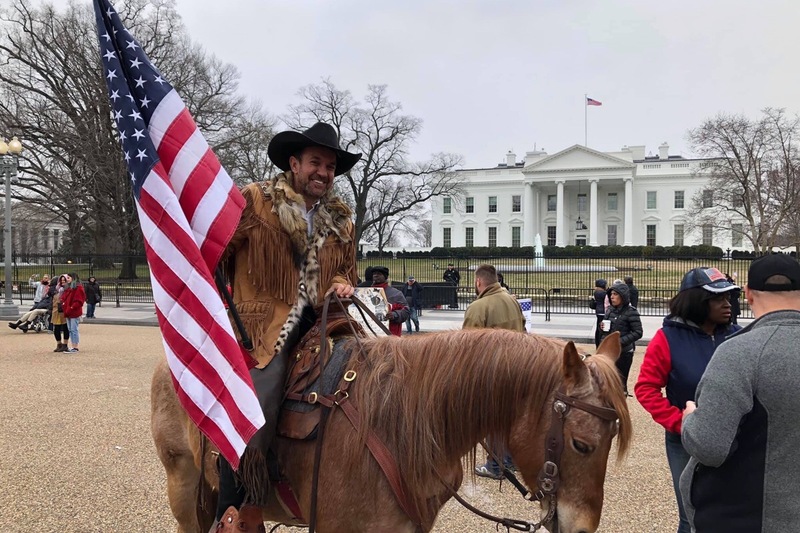 The Cowboys for Trump past accomplishments have entailed a historic horseback ride into our nations capitol, an appearance on Fox and Friends as well as founder Couy Griffin spending a lengthy phone conversation with the President of the United States. Looking into the future the vision for this organization will be to develop state chapters and build a network across America. This network will give voice and representation to those Americans who feel they have been left behind. We are a nation at crisis and at a crossroads. It is time for Lady Liberty to speak and no better platform than that of the American Cowboy. Please ride along with us and make however much of a financial contribution possible. Our motto is to give off a debit card and not a credit card. Please give generously but please give responsibly. We wouldn’t want anyone in your direct line of influence to suffer from your support of this organization because we are certain God will provide our means to travel. But if He lays it on your heart please be obedient to Him. All monies given will be used to support travel expenses for riders to include lodging, meals, airfare, rental vehicles, gas money, horse rentals, literature, feed for horses and horse transport. Thank you so much for your prayers, support, and for your heart to our great nation. This update is to clarify the usage of all donations to this account. Up to date all donations have been used to further this platform to show support for our President. We have used your donations in an effort to pay for horse leases, travel expenses (including meals, lodging), vehicle rentals, plane tickets, horse feed, necessary tack. Funds have also been used in the area of promotion for Cowboys for Trump including a trip to Washington D.C. as well as Las Vegas Nevada for networking and media. There have also been funds used to pay for domain names and merchandise services to help build and promote this platform of support towards our President and his efforts to secure our country. In the future any other funds raised will be used to support upcoming rides to include Atlanta Georgia on April 15th, Las Cruces NM April 25th and Austin Texas on May 4th. To support these rides we will use funds to support travel, horse leases, airplane tickets, hotel rooms and meals. We support your generous support so much and we appreciate your confidence in this mission and this great cause. Any leftover funds from this campaign will be used for another horseback ride to support our President beginning on April 21 of 2019. This ride will also be from Cumberland to DC. Our February 15th ride is coming along as planned! We need your help to keep spreading the word of our journey. Find us on facebook and share our message! Thank you for all your help and support. Together we can spread our support for President Trump and strong border security!